This new rendition of an old favorite lets you match wits against the ST computer in a three-dimensional contest. You can even, if you like, make changes to the program which will make the computer play more aggressively or more cautiously. 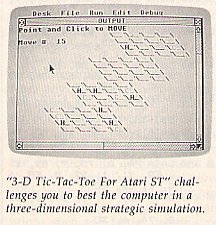 "3-D Tic-Tac-Toe" runs on any Atari 520ST or 1040ST computer with a color monitor. "3-D Tic-Tac-Toe" is a strategy game where you take on the Atari ST in a battle of wits. The object of the game is similar to the traditional Tic-Tac-Toe game, except this version takes place in a simulated three-dimensional space containing four game boards. To win, you must place four pieces in a row. The row may extend across a single plane or vertically though all four planes. Though it's not a flawless player, the ST will provide you with a formidable opponent. It's your turn when the screen prompt appears. Use the mouse to move to the square of your choice, then click the left mouse button. Due to the slowness of ST BASIC, you may need to hold the button down for as long as one second before the computer recognizes your choice. A blue uppercase H appears on the square you have chosen. The H, of course, stands for the Human, you, and the C stands for Computer. You may be interested in learning how the ST plays this simple strategy game. The computer does not use a "look-ahead" technique, but rather determines its move by assigning a numeric value to each empty square. This value is explained in the table, which shows a simple Tic-Tac-Toe combination of four squares in a row, along with the corresponding BASIC line number that assigns the value. Each computer piece is stored with a value of 5 in the V( ) array, and each human piece has a value of 1 in the array. So if a row of four squares contains two computer pieces, that combination has a value of 10. Lines 540-600 then convert these combination values into point values, which are evaluated to choose the next move. Note that the order of pieces in the table has no significance: What matters is the number of pieces and blanks. In the third entry, for instance, the sequence H_HH merely indicates that the row contains one blank and three human pieces, in any order. No value is assigned to a row that contains both computer pieces and human pieces since it's clearly impossible to win on that row. This game is designed so that the computer plays a nearly equal balance of offense and defense. If you would like the computer to play more aggressively, increase the values for offensive moves in lines 590 and 600. For a more conservative game, you can increase the values in lines 560 and 570. With a little experience, you'll find that a change of just one or two points in these four lines will make a significant difference in the computer's move strategy. 180 gosub 840:color 4:print:gotoxy 0,0:print "Point and Click to MOVE"
290 gosub 840:color 2:print:gotoxy 0,0:print "Atari ST's Move        "
450 gotoxy 0,0:print "Computer WINS    ";:a$="C"
680 clearw 2:color 1:print "Loading DATA ..."